I wish that some (many, frankly) sessions at the great INFORMS Conference in Phoenix, November 4-7, 2018 could have been recorded and placed online so that the information/knowledge could be captured and shared much more broadly. For example, on November 6, bright and early, at 7:30AM, I had the pleasure of taking part in a panel under the auspices of the Junior Faculty Interest Group (JFIG) of INFORMS on Advising PhD Students. I was very much looking forward to this panel - to hearing insights from the other panelists and also the questions from the audience and the discussions that would take place. The other panelists were Professors Sergiy Butenko and Joe Geunes of Texas A&M. The panel was organized by Professors Chrysafis Vogiatzis and Ehsan Salari, who are JFIG Officers. The full list of JFIG officers can be viewed here. In the above photo are: Dr. Salari, Dr. Anahita Khojandi, the JFIG President, Dr. Geunes, Dr. Butenko, Dr. Vogiatzis, and yours truly. The panel began with my presentation, followed by a presentation by Professor Geunes, and then one by Professor Butenko. My perspective was that of a Business School faculty member (although I have also supervised several dissertations from Engineering at UMass Amherst) and the other panelists provided their perspectives as Engineering faculty. All of us have graduated over a dozen PhD students. My list of 20 PhD students, whose dissertation committees I have chaired, are featured below, thanks to the Mathematical Genealogy project. In fact, when I was a junior faculty member, I approached Dr. Alexander Rinooy Kan of The Netherlands and asked him what advice would he give me and he told me, as I have stated in the above slide: "build your network and do this by graduating PhD students." 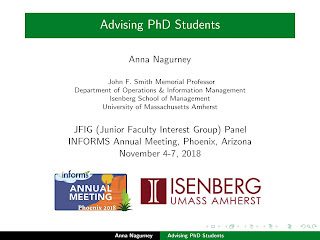 I mentioned in my talk that one of the greatest compliments that I have received was from a senior colleague at a top research university who said that most advisors graduate one or two very successful PhD students, and he was very impressed by how successful many of my former doctoral students are. Indeed, I am a very proud academic Mom, and, what thrills me, as well, is how many of my former doctoral students continue to work and publish with one another - even if they did not overlap as students! The camaraderie and esprit de corps I try to nurture through the Virtual Center for Supernetworks. My full presentation can be downloaded here. The panelists described how they supervise/manage their doctoral students and their research, how often they meet with their students, the importance of having students submit papers to journals during their doctoral studies, and even how doctoral students have "changed" over the years. Different panelists noted that they give different degrees of "freedom" to their doctoral students in terms of topic and research directions, with some beginning as "macromanagers" and then moving to "micromanaging." The coursework, major milestone exam requirements, and teaching requirements at business schools versus engineering schools, were also highlighted as well as how to nurture a student's strengths and how to overcome weaknesses. It was clear that the panelists' experiences with their doctoral dissertation advisors influenced how they mentor/supervise their own students now. Audience questions ranged from how a faculty member learns to keep a professional distance, despite youth, and the order of authors on a publication. I personally believe - and this I emphasized in my presentation - that doctoral students need to develop/grow their skill sets not only in terms of research expertise but also their teaching and service skills (including leadership skills). As for the development of service skills, I emphasized the opportunities provided by the UMass Amherst INFORMS Student Chapter, whether in hosting speakers, or even organizing social events and field trips. In fact, officer activities often comes up when students are on the academic job market. To be a successful academic who have to be able to perform at a very high level in all areas of research, teaching, and service (with service to a lesser extent early in one's career). The panelists clearly showed the passion that they have in supervising doctoral students and even emphasized that they consider this to be their most important role as faculty members. And the panel organizers even presented the panelists with a JFIG mug - many thanks for organizing this interesting panel and also for the thoughtfulness!